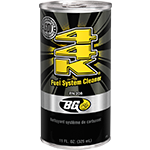 Nothing works better than BG 44K® | BG Products, Inc. I recently purchased a 1998 BMW 323i with over 196,000 miles logged. The vehicle averaged 30-32 mpg on the highway. I filled up the BMW with 89 octane and added one can of BG 44K®. After a couple of hours of highway driving, the gas mileage went up to 40+ mpg cruising between 70-75 mph. I am a huge fan of the product and also use it in my 2004 Nissan Maxima that has 93,000 miles. Nothing works better to improve gas mileage. Thank you!